On July 6, Ambassador Liu Xiaoming was invited to attend the China Europe International Business School (CEIBS) Third Europe Forum 2017 and delivered a keynote speech entitled Turn the Belt and Road Opportunity into Cooperation Highlights. 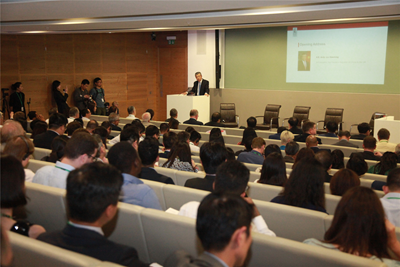 Over 200 people including Li Mingjun, CEIBS President, Yang Jiemian, Chairman of the Council of SIIS Academic Affairs, Augus Knowles-Cutler, Vice Chairman of Deloitte, and representatives of the Chinese and British business communities were present. 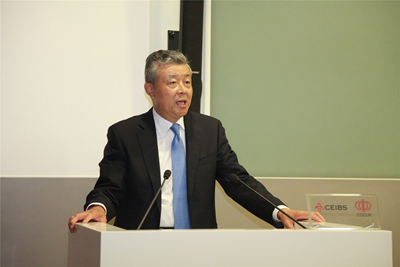 Ambassador Liu first gave credit to CEIBS for training outstanding talents in economic management, enhancing China's economic and social development, and promoting the business cooperation between China, Europe and beyond since its founding more than 20 years ago. The Ambassador pointed out that the Belt and Road Initiative proposed by Chinese President Xi Jinping in Autumn 2013 marks a major step in China's overall opening-up. It is more importantly a public good to boost regional and global development. Four years on, this Initiative has not only enjoyed increasing recognition from the countries along the Belt and Road, but also gathered growing international consensus. First, the Belt and Road Initiative is a concrete endeavor in building a community of shared future for mankind. The Belt and Road building is to realize the common development and progress of all nations by means of stronger policy coordination, infrastructure connectivity, unimpeded trade, financial integration and people-to-people bond, so as to create a shared community of mankind. It points out the way forward with regard to addressing a series of key problems in the world today and seeks to provide answers and solutions to these problems. Second, the Belt and Road Initiative strongly advocates an open world economy. As the Belt and Road connects both ends of Eurasia, it serves to create an open world economy, build a fair, reasonable and transparent international trade and investment regime, facilitate the orderly flow of production factors, enable efficient allocation of resources, and lead to a higher degree of market integration. Third, the Belt and Road Initiative encourages diversity and innovation. It seeks multi-level, broad-ranging people-to-people ties. As more and more countries, international organizations, multinational companies, financial institutions and NGOs are involved in this Initiative in different forms, the diversity and creativity within the Belt and Road community is showing its great strength. Fourth, the Belt and Road Initiative is a demonstration of China taking the lead to advance win-win cooperation. This Initiative will encourage closer international cooperation, enhance connectivity, align China's development with that of the countries along the routes, and seek to realize win-win cooperation that China has always advocated. Ambassador Liu said that Britain is a country of global influence, and also a key partner for China in building the Belt and Road. China and the UK have a clear-cut political consensus and a solid foundation for cooperation on the Belt and Road. Their respective strengths make a perfect match which promises China-UK cooperation a bright future. China and Britain should build strong partnership, work as a team, turn opportunities into cooperation highlights so as to sustain the China-UK "Golden Era", and deliver more to the people of the two countries and beyond. 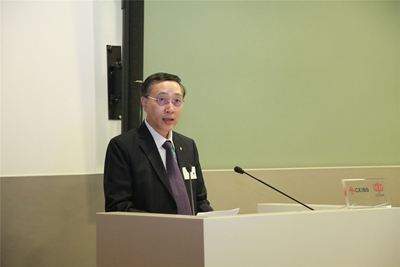 In his speech, President Li Mingjun hailed the China-UK "Golden Era". As the world's fifth largest economy with sound investment environment and huge trade advantages, Britain is a major investment destination for Chinese enterprises. The Belt and Road Initiative proposed by China will further promote the exchanges and cooperation between the two countries. 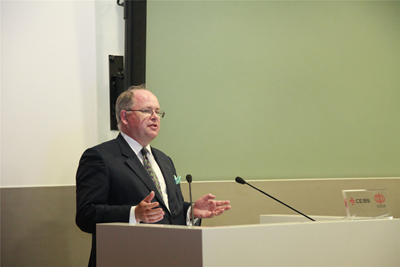 He hoped that the CEIBS's Europe Forum to be held in London, Paris, Warsaw, Munich, and Zurich would further promote China-UK and China-Europe cooperation, especially the cooperation between the enterprises of the two countries, to boost the innovation-driven development and shared prosperity. Chairman Yang Jiemian said in his speech that China and Britain, located at the east and west ends of the Belt and Road respectively, have complementary strengths and broad space for cooperation. Focusing on economic cooperation, the Belt and Road Initiative will create more market, investment and employment opportunities for the two countries. As the initiative is committed to policy coordination, interconnectivity, and people-to-people and cultural exchanges, China and Britain may further strengthen the strategic and political connection, such as the connection between the Belt and Road and the Northern Powerhouse. Vice Chairman Knowles-Cutler said that in the "new normal" full of uncertainties, Britain and China are complementary to each other in many aspects and share huge potential for cooperation. The two sides should grasp the opportunities so that the UK-China cooperation could bear fruitful results. 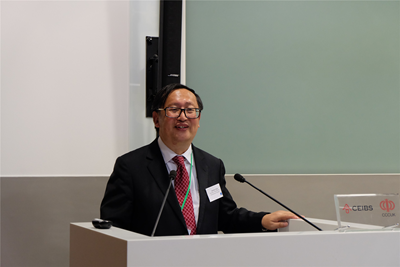 Ding Yuan, CEIBS Vice President and Catherine McGuinness, Chairman of the Policy and Resources Committee of the City of London Corporation delivered keynote speeches on the opportunities and challenges of globalization for Chinese enterprises and China-UK cooperation on the Belt and Road Initiative. Representatives from Chinese and British enterprises such as ICBC London Branch, the London Taxi Company and SanPower Group had in-depth discussions on how to invest in Britain.